We call it link_order.txt and put it to the folder with unpacker project sources. This file will provide the resulting file functions order to linker. Let's set this file in project settings Linker - Optimization - Function Order - link_order.txt. That's all, the setup is completed, let's develop the unpacker! Firstly, I increased the amount of data allocated on stack up to 256 bytes (sub esp, 256). There are a lot of local variables, so let's get reinsured, if suddenly 128 will be insufficient. We don't need to initialize LZO algorithm before unpacking, it is enough to call one function to unpack, and we did that. Further we have to calculate first section header virtual address. Now you understand, why we need to write our own function prologue and epilogue in assembler. Instead of ret instruction, which was placed at the end of unpacker code, we put jmp eax instruction, which performs jump to original file code. 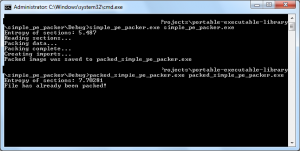 So, the packer can process simple PE file now, which has import table only. Any file with resources, TLS, exports will not work, and we will manage this at the next steps. But we can pack ourselves and run the packed file! 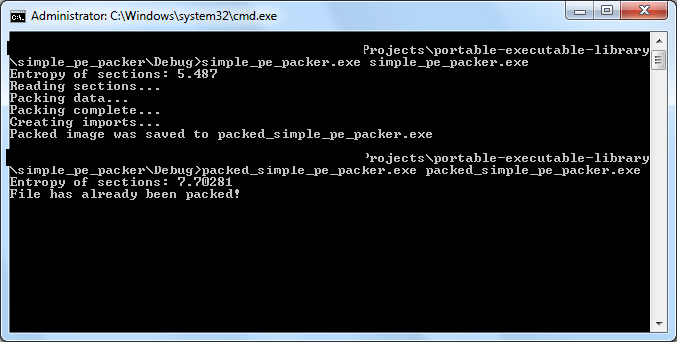 As you can see, we packed ourselves, got the binary file packed_simple_pe_packer.exe, and it works!